Jakarta (VNA) – The first 2019 meeting of the ASEAN Connectivity Coordinating Committee (ACCC) and the third meeting of the Lead Implementing Body for Sustainable Infrastructure (LIB-SI) took place in Jakarta, Indonesia from March 25-26. 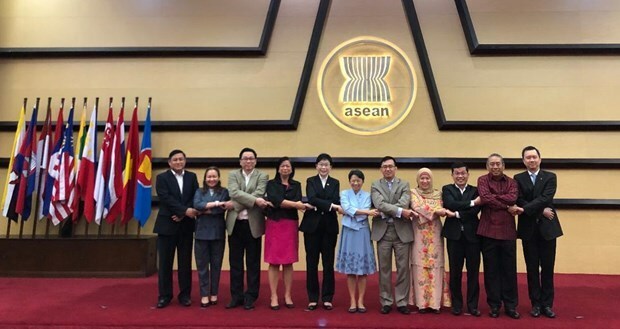 A Vietnamese delegation led by head of the Vietnam permanent mission to ASEAN Tran Duc Binh, who represents Vietnam at the ACCC, attended the events. The events spoke highly of positive progress in carrying out the Master Plan on ASEAN Connectivity 2025 (MPAC 2025). Among 15 initiatives for MPAC 2025’s five priority fields, three involving sustainable infrastructure, three on digital creativity, two on trade facilitation are underway. Meanwhile, seven on transportation, harmonisation of technical standards and facilitation of people’s travel are in preparatory stage. Partner countries and international organisations pledged to continue assisting the bloc in implementing its MPAC 2025 projects. With the support of Australia and the Economic Research Institute for ASEAN and East Asia, two research projects have been basically completed, including the ASEAN Sustainable Urbanisation Strategy and the Study on Micro, Small, and Medium Enterprises (MSMEs) Participation in the Digital Economy in ASEAN. At present, the World Bank is helping ASEAN build a portfolio of sustainable infrastructure projects based on 40 proposals in the fields of road and railway infrastructure and power grid. In particular, the projects on Ho Chi Minh – Moc Bai highway and southern coastal corridor (the second phase) have been added to the list of priority projects that call for capital. Connectivity priorities during Thailand’s ASEAN chairmanship 2019 and 2019 – 2021 Working Plan for MPAC 2025 were adopted. Accordingly, ASEAN member states will pool resources to build data on roads for commercial use, build a framework to assess the efficiency of supply chain, promote ASEAN tourism via electronic information, and improve regional vocational training. The meetings highlighted the need to popularise contents and benefits of MPAC 2025 and attract the involvement of the private sector, partner countries, regional and global financial organisations in the process. Participants agreed to encourage the involvement of ASEAN specialised agencies in MPAC 2025 projects, enhance mechanism of coordination in implementing MPAC 2025 projects and regional connectivity initiatives by partner countries such as China, Japan, the Republic of Korea and India.